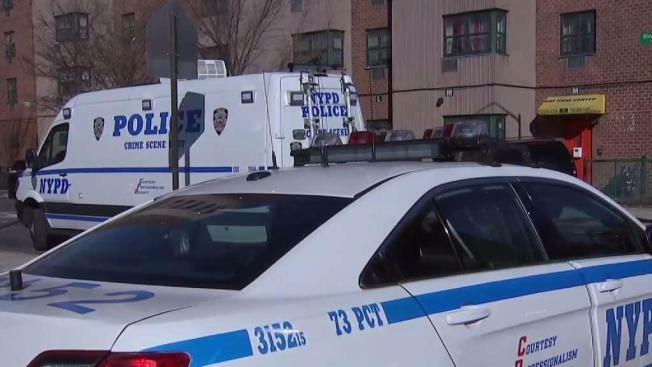 Four relatives, including a 1-year-old girl and a 16-year-old boy, were found dead, shot in the head, in various rooms of a fourth-floor apartment at a huge residential complex in Brooklyn, authorities and law enforcement sources say. Marc Santia reports. Four relatives, including a 1-year-old girl and a 16-year-old boy, were found dead, shot in the head, in various rooms of a fourth-floor apartment at a huge residential complex in Brooklyn early Wednesday, authorities and law enforcement sources familiar with the investigation tell NBC 4 New York. All of the four found shot were pronounced dead at the Riverdale Towers scene on Thatford Avenue in Brownsville after cops responded to a 911 call around 5 a.m. Another family member found the bodies and called police. The grisly crime scene is a three-bedroom apartment. One-year-old Laylay Briggs and her father, 27-year-old Terrance Briggs, were found dead in one bedroom. Sixteen-year-old Loyd Drain III was found dead in another bedroom and 57-year-old Loyd Drain Jr. was found dead in the bathroom, authorities said. The teen killed was the stepbrother of the 27-year-old man, who was the stepson of the 57-year-old. No one is in custody and no motive has been developed at this time, authorities said. Investigators are trying to determine whether the deaths were murder-suicide or if a suspect is on the loose, sources say. Law enforcement sources say there was no sign of forced entry to the apartment. A gun, bullet and shell casings were recovered at the scene, which authorities described as a horror. "In the nature of this business we deal with death and tragic scenes, but when it involves an infant it's extremely tough," Brooklyn North Assistant Chief and Commanding Officer Jeffrey Maddrey said. Chopper 4 over the scene showed a huge police presence with several local streets blocked off. A woman was seen on a stretcher outside, holding her chest and crying; it's not clear if she's related to the four dead. Crime scene investigators were seen carrying evidence bags and equipment in and out of the home. Cops are reviewing surveillance video from the area. Neighbors and friends of the victims described the family as social and well known in the area. "My heart is so numb right now. Again, numb," said Vanessa Swain, a family friend. "Something knocking on my door at 7 o'clock in the morning ... all of them gone."